A video crew consisting of community members from Cuba's Sierra Maestra mountains films a documentary as part of TV Serrana, a community television project visiting UCSC April 15. 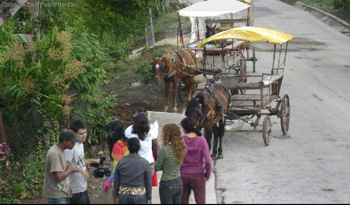 Short video documentaries produced by Cuban campesinos will be shown Friday, April 15 when Cuban filmmaker Carlos Rodriguez visits UC Santa Cruz as part of a tour of U.S. universities. The event is free and open to the public and runs from 12:30-2 p.m. in the Cervantes Room at the Bay Tree Book Store building. 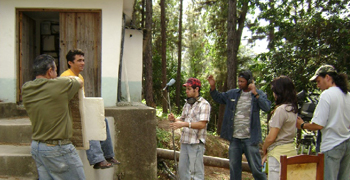 Rodriquez is a member of the renowned TV Serrana television project that has helped rural Cubans in the Sierra Maestra mountains produce nearly 500 documentaries since 1993. The project will visit 13 universities in 12 cities, in its first tour of the United States. "Part of idea is to show people a vision of Cuba they've never seen before," said Alexandra Halkin, who will accompany Rodriguez on the tour. Halkin is a documentary filmmaker and founding director of the Americas Media Initiative-Cuba Media Project, a new initiative to distribute Cuban independent and community videos in the U.S.
Halkin said 21 documentaries have been translated for American audiences. The documentaries are all produced by families describing their lives in the Sierra Maestra. "There's a wide range of subject matter," Halkin said. The 15- to 20-minute documentaries are "about their culture, lives, problems. It's to educate people in the U.S. that Cuba is a diverse country. It's not just Havana," she said. TV Serrano was founded with funding from UNESCO, the Cuban government, and the National Association of Small Farmers. The visit to UC Santa Cruz is sponsored by Latin American and Latino Studies, El Centro (Chicano Latino Resource Center), and Film and Digital Media.